We so often correspond with one another via written communication in the form of e-mail, memos, and texts. This type of communication, as well as our use of grammar, can say a lot about us: like whether we are detail-oriented if we take our time, that we understand basic sentence structure and/or how much we value the message we are trying to convey. Even if writing is not your forte or interest, it is a valuable (and necessary) skill to be able to effectively communicate via the written word, particularly in a professional setting. You don’t have to be a scholar, an academic or professor to prioritize proper English and written communication. Imagine reading an email that is jumbled and incorrect and unclear; no one, not a manager or subordinate, likes to feel confused when deciphering and decoding messages. Therefore, it is important, particularly in a work environment, to remember some important principles. So, in honor of March 4th, National Grammar Day, and as a quick refresher, here are three tips to help improve your writing. 1. Understand Possessive Apostrophes. First, don’t be overwhelmed by this verbiage — it is simpler than you think! We use apostrophes for two things: possession or contraction. Possession is fairly straightforward. For example, if Henrietta has a red car, you might say that the red car is Henrietta’s — it belongs to her. Possessive apostrophes only start to get tricky when the name of the person or place you are talking about ends with an “s.” For example, let’s say your friend, Sam Thomas, owns a brick house. How do you showcase the possession? Easy, because the name of the person ends with an “s,” the apostrophe should be placed after the “s.” So: Sam Thomas’ brick house is on the corner of First and Fairmount Street. While many tools exist to help you through or automatically correct your grammar mistakes, like Grammarly or Scribens, it is still important to understand “the why” behind good grammar. Imagine writing a work email to your boss that specifically mentions their name or the names of your colleagues. You would definitely consider it a priority to spell their names correctly, right? And what if because of a misplaced possessive apostrophe, you actually spelled or cited them wrong? Of course, mistakes happen and oversights like this are forgivable, but if it is an ongoing occurrence that you don’t even realize: over time you may come off as heedless or worse, unaware. You want to make sure you give appropriate credit to the owner of something, (e.g., Sam’s proposal or Jane’s important e-mail). 2. Master Contractions. Most of us know when to use a contraction when it comes to simple things like turning “cannot” into “can’t,” and “will not” into “won’t,” but some of the trickier contractions come in to play when we are writing “you are” (you’re) and they are (they’re) because this is where the entire sentence structure and message can change. For example, if you want to say, “you are special,” you could use an apostrophe to contract the statement and make it, “you’re special.” This is a good example for understanding contractions so that they do not become incorrect grammar (e.g., it would be incorrect in this instance to say “your special”). Not only are contractions important because they can help determine your message, but they also help show that you are (or you’re, if you will) a detail-oriented person who takes time and care with your communication. Additionally, depending on the context of your message, and how formal or informal the correspondence is, sometimes contractions are not necessarily appropriate. Some professionals argue that contractions are sloppy, while others say that they help create an easier flow for the reader to follow. 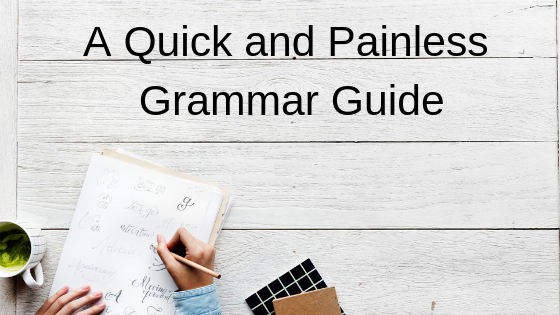 Ultimately, it is up to you to decide whether or not you incorporate contractions into your writing, but be advised that it is definitely worthy of your consideration and thought. 3. Know Your Homonyms. Homonyms are those tricky English words that sound the same, but are spelled differently, (e.g., “ate” and “eight”). The English language is wonderfully varietal in the way, but it can be frustrating to master as we have many words that sound similar, but have completely different meanings. As you probably are aware, one of the most common word clusters is “to, two, and too.” And how do you determine the difference? Most people are able to determine “two” as being numerical. But being able to understand the difference between “to” vs. “too” lies in the context of how it is most often used. Something that is “too funny,” “too silly,” or “too cold” indicates an excessiveness, right? Right. So, an easy reminder about using “too” is its extra “o,” which is, in and of itself, excessive. Make sense? Whereas “to” with one “o” is most often used to showcase a directive (e.g., “Sarah and Sam are going to the store). If this sounds too technical, overcomplicated or unnecessary to understand: it’s actually important! Again, your attention to and understanding of these types of details tend to say more than you might realize, like it or not. Poor grammar (and spelling!) can distract the reader from understanding or focusing on the content or purpose of your message. Think about how important that could be if you were trying to relay thanks, congratulations or even dismay to a boss, subordinate or colleague. The best thing to do with grammar and punctuation is to practice and differentiate between how you might communicate casually in a text vs. how you want to communicate in a work email. If you aren’t sure about something, utilize your resources: Google, a co-worker, or ask someone to briefly review and offer edits to your writing. Keep working on your syntax and continue to improve your professional acumen as it can be a valuable resource for any job. Again, even if technical writing and English is not your specialty, strength or even something you enjoy at all: it is a vital component to how we communicate in a digital era and it is an incredibly powerful tool that you can utilize to your professional advantage.